The Phantoms take on the Steel. - The Phantoms make multiple comebacks to beat the Chicago Steel 6-5. For the first time this season the Phantoms faced off against conference rivals, the Chicago Steel. With neither team being well known for defense and goaltending this season, it looked like the weekend series might feature some high scoring games. And Friday did not disappoint. The Steel jumped out to an early lead. 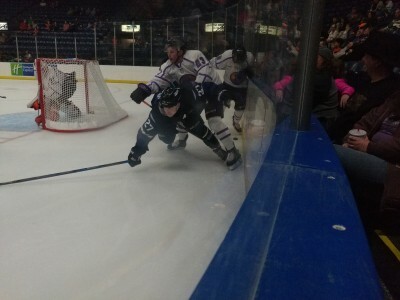 With Gunnarwolfe Fontaine carrying the puck into the Phantoms zone along the boards, the Phantoms defense collapsed over to the left side leaving Mathieu De St. Phalle alone skating up the slot. De St. Phalle backhanded a shot that netminder Christian Stoever got a piece of but the puck still carried up and over him and the score was 1-0 at 4:09. The Phantoms would get it back on a powerplay with 3:04 left in the first when a Liam Robertson shot was partially blocked. The puck trickled to Brett Murray who tapped it to the slot for a Connor MacEachern one-timer. Shots were 10-9 in favor of the Phantoms heading into the first intermission. The Steel would retake the lead early in the second. De St. Phalle will get credit for their second goal of the night but the puck looked like it came off the stick of MacEachern. De St. Phalle lifting MacEachern's stick as he tried to skate it behind his own net, the puck rolling passed an unprepared Stoever just 0:22 into the frame. The Phantoms get revenge. - The Phantoms fought the Fargo Force to a 3-2 OT win in a rematch of last years Clark Cup Finals. For the third time in 3 weeks, the Phantoms managed to open the weekend by winning the first of back-to-back games. Last night, we managed a thrilling dramatic win over the Clark Cup Champion Fargo Force. The last time the Phantoms and Force played was the night the Force were handed the cup on our ice. Needless to say, this game was a big victory for the returning players and team moral. The Force got on the board first, shorthanded at that with Tanner Vescio in the box for hooking. Fargo's Connor Meyer cleared the puck out of the Fargo zone where Ben Meyers and Hank Crone were behind the defense. Mayers ended up with the puck along the left halfboards and sent a pass to Crone at the far goalpost who tapped it in behind netminder Vinnie Purpura for a 1-0 lead at 8:18 of the first. The Phantoms would get that back on the next power play at 12:30 with Vescio in the box for hooking, again. Defenseman Liam Dennison carried the puck from the blueline to below the goal line where he centered a pass to Brett Murray. Murray was able to kick the puck from his skates to his stick and push the puck into the net, where Fargo netminder Ryan Bischel had momentarily left the near post open. 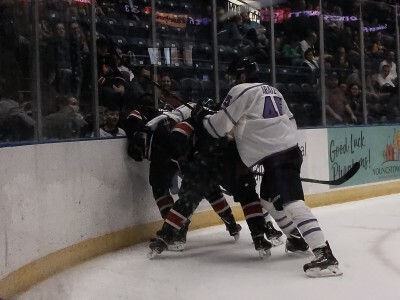 The Phantoms fight for the puck. 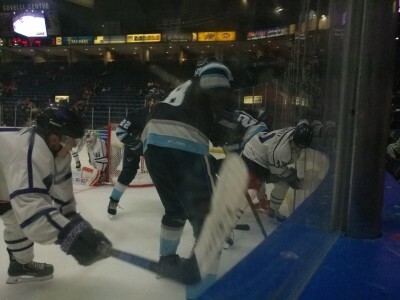 - The Phantoms try to dig the puck out from along the boards against the Madison Capitols. It always amazes me the way bottom teams in the league manage to pull off a few upsets along the way. In some regards, it goes a long way to showing the parity of the level of competition from top to bottom, lower standing teams are able to play up to the level of the top teams. In other aspects, it shows how some teams can play down to the level of their opponents, no matter how bad they are. Saturday's tilt against the Madison Capitols was a showcase for the latter. After beating the Caps 5-2 on Friday, the Phantoms seemed to lack any sort of motivation, (and there certainly wasn't much in the way of team effort) at least through the first 2 periods. At least the first frame wasn't so bad. The Caps seemed to outplay us by some margin but it didn't seem that either team was really in the game. The only excitement came on a Phantoms powerplay, with Matthew Gould off for a hold, his second penalty of the game. Gould didn't seem too happy with the call, I guess, and about 15 seconds into his time in the box, he gave the glass a few good whacks with his stick that resulted in a stoppage to change a pane of broken glass. Needless to say, that was all for Gould's night. It was a scoreless period with shots 11-8 in favor of the Caps.